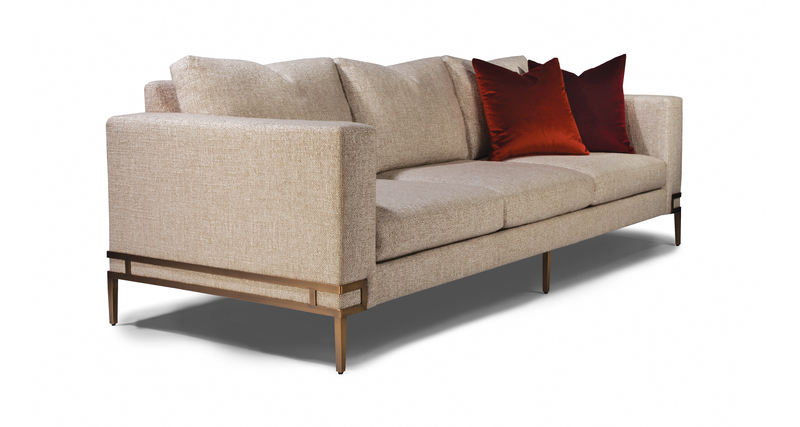 Designed by Ransom Culler, the Manolo sofa is one of our new contemporary classics. The Manolo sofa features elegant but powerful high-heeled legs available in brushed bronze or polished stainless steel. Select any of our in-house curated fabrics or leathers or provide COM. Coordinating lounge chairs and modular sectional sofa items are also available, see our lounge chair and sectional sofa galleries. Height to top of back cushion is 34 inches approximately. Shown with brushed bronze legs. Also available with polished stainless steel legs as No. 1339-303. Throw pillows optional.